Mascus, the fastest-growing online marketplace in the world for the sale of transportation vehicles, construction machinery, agricultural, material-handling equipment and forestry, is now making it even easier for all its users to access the website, with the launch of the new fully responsive version of the marketplace. The new responsive website enables Mascus users to browse through ads listings on their traditional desktop computer, smartphones or tablets without changing environment and losing some of the features of the main desktop version. Sellers will also be able to manage their content directly from their mobile devices. The new design has been developed to make Mascus accessible whether you are at your desk and using your traditional computer or on the go using a mobile phone or a tablet. 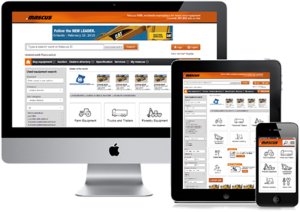 “We know that more and more users are accessing online content via their mobile devices and this is no exception with the heavy machinery industry.” explains Mascus COO Rickard Krøtø. “Our users and customers are often away from their desk and computer, but they are always connected and have their smartphone or tablet with them. The responsive website offers them the opportunity to check Mascus with any type of mobile device without losing the features that the full desktop version is offering. Besides the improved user experience, buyers will be able to access Mascus while on the go and contact sellers at the touch of a finger while sellers will have the chance to be more reactive to the demand and manage their stock from their mobile phone or tablet.” adds Mascus Marketing Manager Gauthier Dominicy. Users can access the full responsive website to browse listings that are organized into “easy to navigate” categories. When customers click on a listing, they will see the seller’s product photos, product details, pricing and location information. Customers can then call the seller’s number right from the listing to make their inquiry. The new website is part of Mascus’ continual improvement plans to deliver a better experience and easy to use platform to all their users. “The new responsive website takes Mascus to a new level by making it a more flexible for everyone to use,” explains Tim Scholte, Mascus CEO. “We recognized the importance of producing a system that is user-friendly, no matter what environment it is accessed in, and that includes via mobile phones and tablets. Mobile devices are already passing over traditional computers and laptops to browse internet, so having a website that makes the Mascus marketplace accessible anywhere anytime and with any device was a necessary step for us. It also reinforces our commitment to customer-oriented improvements,” he adds. “The mobile websites that we have built for our customers for the last 2 years has proven to be successful so it was only logic for us to apply this trend to the public marketplace. As smartphones and tablets become the norm as well as mobile broadband connectivity, we believe that the new responsive website will prove to be extremely popular with Mascus users across the world and in delivering a better browsing experience and quality service to our customers” concludes Tim Scholte.